This snuggly blue bear blanket is perfect for little hands. It offers a super soft, cozy feel that is perfect for your little boy. 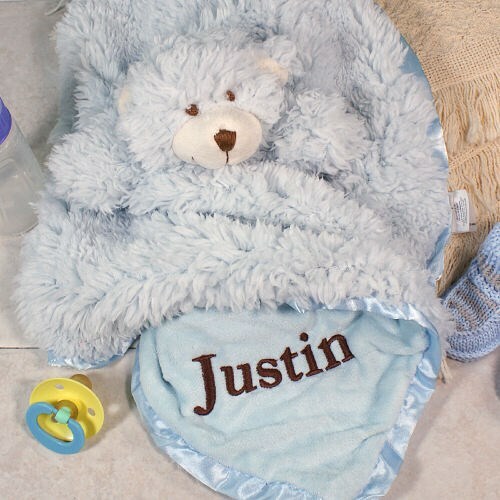 Welcome your new baby boy into this world with a keepsake blanket he'll enjoy each and every day. Featuring Sherpa Plush combined with satin trim this bear blanket measures 18" x 18. With 100% polyester construction, it is machine washable on gentle cycle. Tumble dry low. Free personalization is included. We will embroider any little boys name in brown thread. Free gift wrapping and a free gift message are included to create a thoughtful presentation. cute but the bear didn't stand out as much as I wou;d like it to. Additional Details Browse our entire collection of Stuff Animals for Baby Boys to present your son, grandson, nephew or any sweet little boy in your life. A personalized plush animal is a wonderful keepsake they'll always enjoy.